He was born in France, but spent most of his adult life in the Dutch Republic. His philosophical writing is influential to many, and some refer to him as the Father or Modern Philosophy. He continued his work up through his final days, which he spent in Sweden. Descartes was well known and well respected amongst his peers. Additioanlly Descartes is credited with providing the groundwork for what Sir Isaac Newton and Gottfried Leibniz independently used to help create modern day calculus. Specifically he used calculus principles for a line of tangent - which is a line that intersects a circle in exactly one point. He also contributed to the field of optics, by identifying laws of reflection and refraction, and identifying that a rainbow's radius is 42°. However, Descartes is probably most famous for his work in analytical geometry. The coordinate plane is commonly referred to as the Cartesian Coordinate because Descartes was so instrumental in developing it. Essentially Descartes was the first person to use algebra to describe geometry. So if you love solving algebra problems in your geometry class, you have Descartes to thank (we won't talk about anyone who doesn't love algebra)! 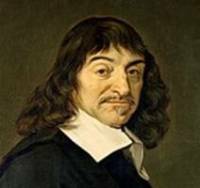 Because of his work, Descartes is commonly refered to as the father or analytic geometry. Return from Rene Descartes to other Famous Math People.